– It must write smoothly, without scratching or dragging on the paper. – The ink should not glob, on the paper or on the tip of the pen. – Bonus Points: comes in more colors than blue, black, and red. These pens glide across the paper and the ink is acid-free, quick drying and vividly pigmented. When taking a lot of notes or if I need to write quickly, this is my go-to pen. 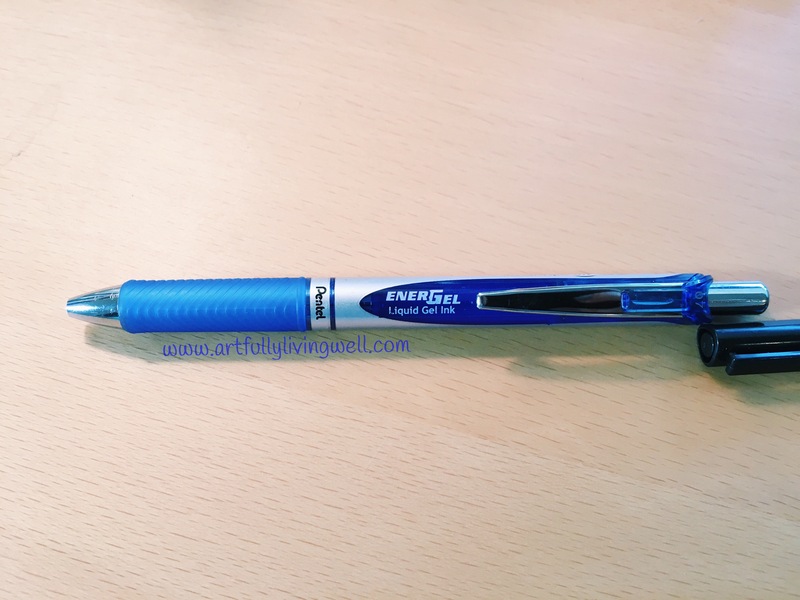 The EnerGel hits all 3 of my musts and gets bonus points for coming in a wide range of colors and being refillable. Side note: I have preferred blue pens since college. It’s a leftover from my previous career as a Contract Negotiator for some of the largest companies in the US. Blue stands out more when marking up documents and isn’t as aggressive as red. I’ve gone through MANY blue pens in the last 15 years and THIS is the one I’ve stuck with the longest! These are amazing for precision work. 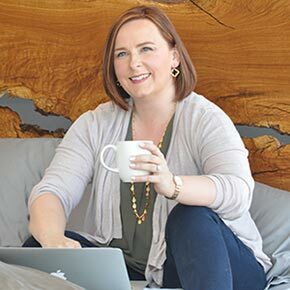 They are loved by many in the Bullet Journaling world for good reason, but fair warning – they are NOT cheap. I use my Fineliners to draw out my weekly planner layouts and for jotting down tasks, etc. I have written longer pieces with them, but I’d much rather grab a different pen for a handwritten letter or journal entry. 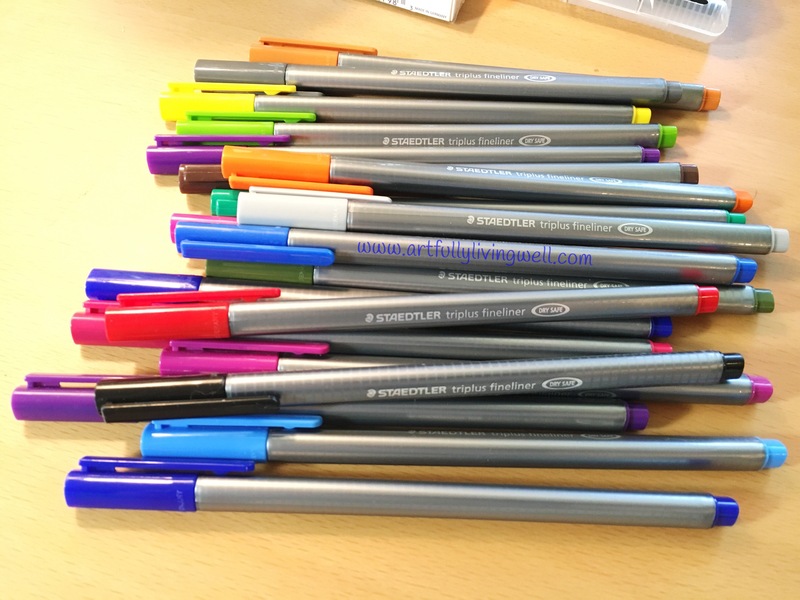 The Fineliners can be a bit scratchy to write with, but the ink is smooth and nearly instantly dry on most papers and they come in a very large array of colors. You can find basic sets at Target, but the best deals are probably on Amazon or if you have a big coupon to Michael’s or Jo-Ann’s you can snag one of the big sets for a reasonable amount of money. Sigh. 😃 These are at the bottom of a rabbit hole you should think long and hard about before getting too involved! The cost can be anywhere from a few dollars for a disposable one (yep, in Europe EVERYONE writes with one and they are as ubiquitous as ballpoint pens are here in the states) to literally thousands of dollars. I have 3 fountain pens: the original one I bought on my first trip to France in 1997 which is a plastic case and pretty cheap, but refillable with cartridges, the fancy Waterman I purchased on another trip to Europe in 2004, and a Pilot Metropolitan which I recently purchased for about $15. I’ve been very pleased with the Pilot in a fine tipped nib. 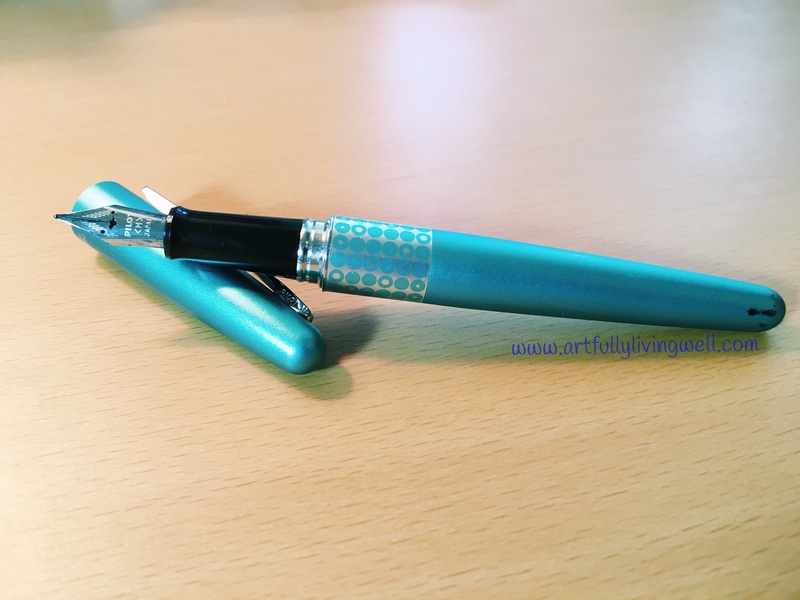 It writes very smoothly, with very little drag and after watching a few YouTube videos from the awesome folks over at Goulet Pens I learned a lot more about how to refill, flush, and clean my fountain pen. These pens take a bit of maintenance, but will certainly last you a lifetime if handled with some care. As for inks, well, fountain pen ink doesn’t dry very quickly, but the sky’s the limit for colors if you buy bottled ink and a cartridge that can be refilled. Fountain pens are the most relaxing to write with as you’re not pushing the ink onto the paper, it’s simply flowing as you move the pen across the page. While it might take you a couple sessions with your pen to get used to it, they really are not complicated. I wouldn’t hesitate to recommend them to anyone who is interested in trying to write with one. 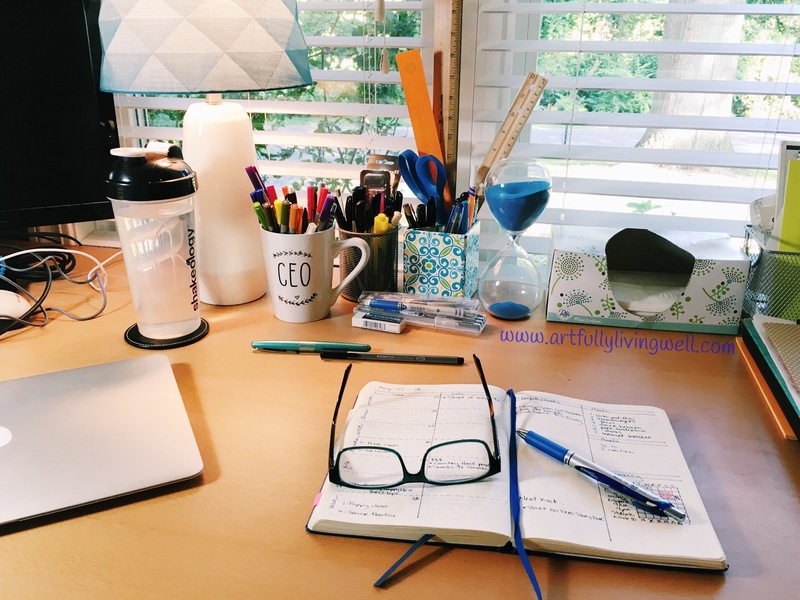 Hands down – for long journal entries or letters, the fountain pen is my first choice. So there you have it! 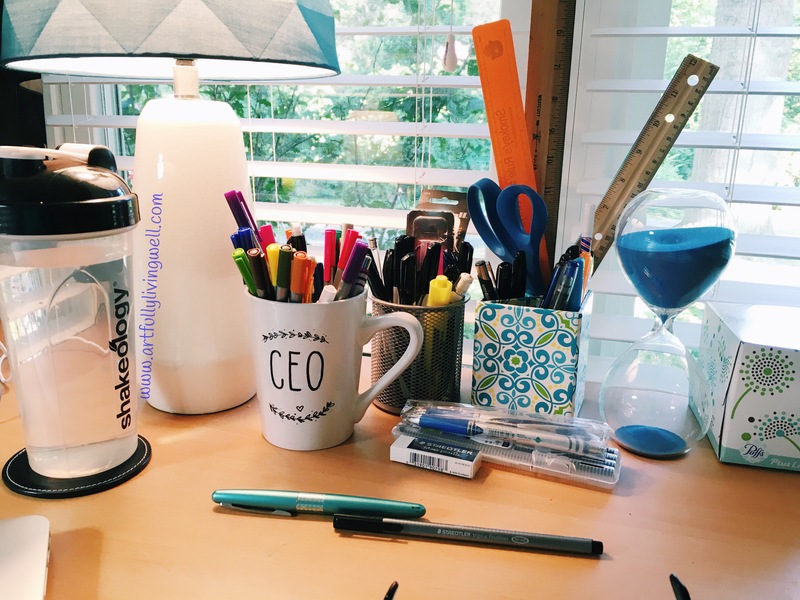 Straight from my desk to yours – my favorite pens! Yes, this is JUST what I use routinely, why?? Pilot Metropolitan Fountain Pen – find a million more pens at www.gouletpens.com!